Savate ahoy! 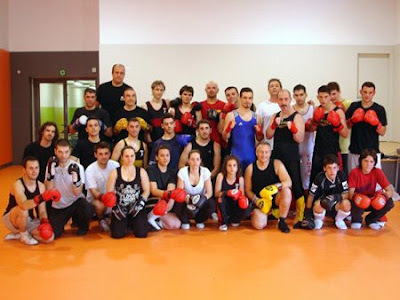 Jose Gil IBERNON was perfectly heard and understood when he invited people to participate in a Savate training camp in Mataro. However, it was not so easy to get trainees and trainers from all the country all together when the season quietly ends while the sun shines offering many free moments to chill out with fresh sangria and tapas. Never mind! Some trainees flew around a thousand miles to go to Mataro. Almost forty people - young and older males and females - accepted the invitation of Jose Gil IBERNON to participate in the camp run by Arnaud MIMOUNI, in charge of the Pole Espoir Savate in Vichy (National High Level Savate Centre for Juniors). The event was undoubtedly a success thanks to a high quality planning lead by the president’s wife and team. A warm and friendly home made welcoming! The traditional Spanish receipt! Despite their various levels, the trainees fully involved in the project as perfect students working hard on defence and counter attacks. Arnaud MIMOUNI really appreciated the perfect organization of the camp and could also estimate local fighters’ level which is good enough to predict they would soon compete in international Assaut events. This is the ambition and the dream José has. He is intimately convinced that Savate has pure and strong values. He really thinks that Spain could be a great nation in Savate. Let’s hope his wish comes true!